JP Freestyle/Wave 2013 TECHNOLOGY PRO – Pro Edition in Carbon Innegra Technology – 77, 84, 92, 101, 111 (only the 3 small PRO boards come with Thruster boxes, covers and fins) FWS – Full Wood Sandwich Technology – 84, 92, 101, 111 UNCOMPROMISED ALL IN ONE! JP originated this board class. The others followed. Some brands even also call their boards Freestyle Wave. If you want the original you don’t need to look anywhere else. With the thruster setup for the smaller PRO Edition sizes (77, 84, 92), we are a step ahead again. Fast and fun boards to blast around. Easy to control in the air, but it’s during maneuvers where they really stand out. They carve superbly whether you crank them hard or carve them smooth. Shorter and compact with the center of gravity and the widest section close together. This guarantees balance and stability, whether planing or not. Slightly increased tail thickness to create a rounder constant dome, producing good grip and a very comfortable stance no matter if your foot is close to the rail or more towards the center line. The rail radius is kept thin and sharp to offer great grip in the turns. The outline is more drawn out around the tail and straighter between the straps, adding planing surface for better low end performance and additional pop. Consequently it creates a longer rail line offering more control in high speed runs and surfing ocean swells. The footstraps are slightly further back, allowing to use the fuller outline radius for snappy turns by pushing on the back foot. It also creates additional speed in more drawn out turns when applying more pressure on the front foot. The bottom is equipped with a constant Vee and double concaves running through. The flat curve in the concaves between the straps delivers great early planing and speed while lots of bottom curve in the rail line provides good maneuverability. The double concaves under the mast base cushion the ride over chop. Great all-rounders with a ridiculously wide range of use. 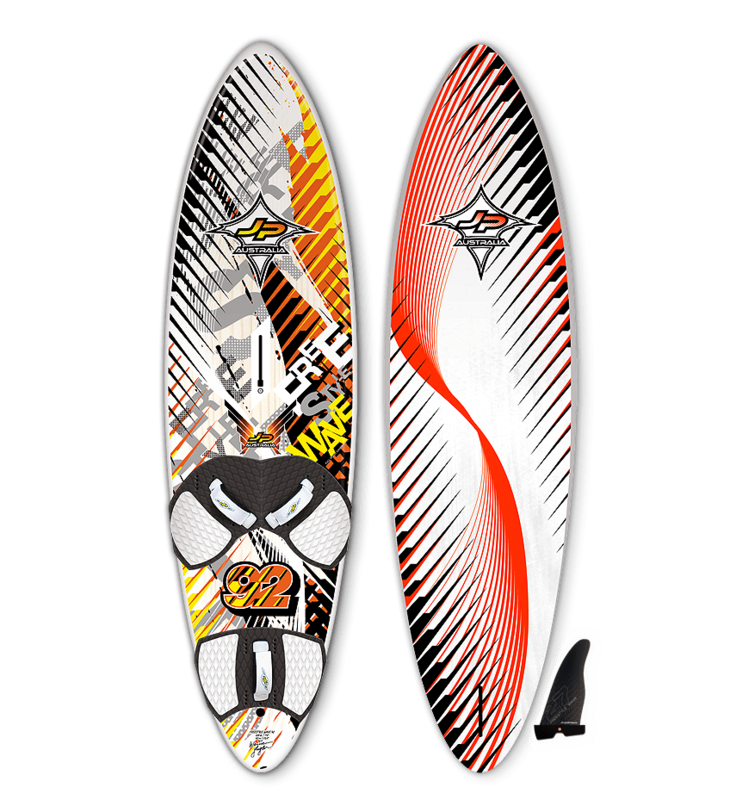 Deliver a perfect balance of wave, seriously fast bump & jump and freestyle performance. The three small Pro Editions additionally handle any kind of wave conditions (from side-on to side-off) because of their Thruster set-up. Their range of use is as wide open as your ambition and mind.